What Happens When Summer is Over? Gallup got a lot of attention today for a news release reporting that the Republican lead over Democrats in the generic congressional poll had blown out from three points last week to ten points this week. It’s only one poll, but it was a pretty dramatic result. So I went over to Pollster.com to see what their latest poll aggregation showed. It’s on the right, with the period from June through August highlighted in pink for both 2009 and 2010. It’s not instantly obvious to the eye, but it turns out that pretty much the same thing happened both last year and this. 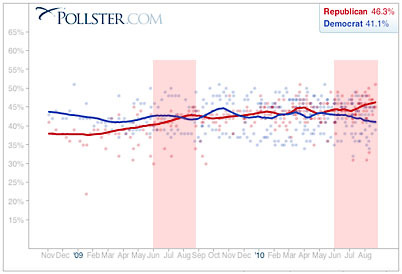 During the three months of summer in 2009, Republicans went from -2 to +1, a change of three points. This year they went from +1 to +5, a change of four points. So what does the recent change mean? I don’t know, but if I had to guess I’d say it shows that conservative hysteria during a slow news season is a pretty effective attention getter, at least in the short term. Last year it was death panels and frenzied town hall meetings. This year it’s the Ground Zero mosque and a Glenn Beck rally on the Mall. So will they lose some of this lead as summer winds down and there’s a little more real news to report, as they did last year? Beats me. But I wouldn’t be surprised. This is shaping up to be a bad year for Democrats, but once August is over, everyone goes back to work, and the real campaigning begins, things might tighten back up a bit.